PC Requirements: Pentium 233, 32 MB RAM, 8x CD-RPM, 200 MB of free space in hard drive. So, after the success of Baldur's Gate, Bioware felt they needed us fans to get something in the meantime while waiting for Baldur's Gate II to play with, and so they decided to give us Icewind Dale. 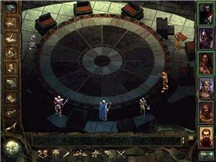 On first glance, it does not seem so very different from Baldur's Gate, only except here there are no npc´s, but you make the whole party yourself (this excludes any chance of the party interactions I was so fond of in BG2, and even in BG1, there were some), and this process is just as in Baldur's Gate, where you choose different attributes, portraits, sound sets and so on. The story and the game starts off with your party in Easthaven, where you supposedly just are passing through, and are approached by a man named Hrothgar, who needs your help with a job guarding a caravan. From here you are on your own however, to explore and take quests until you feel you are ready to go. The first thing that strikes you is that this game is so much harder than Baldur's Gate. Mostly due to the great number of enemies. Even in Easthaven, where your party members are only level one and can take perhaps 2 hits or something like that with the lightest of weapons, the first thing you encounter is a small horde of goblins attacking you. And they do it with bows, so it is kind of hard to get to them. But this however can be managed with a great deal of patience. Not to uncover too much of the story, the caravan is buried under tons and tons of snow in a pass called Kuldahar, and from there it's up to you to make your way to Kuldahar, a small village which also apparently needs your help, and this is what you could call a "base of operations" for your party, where you go back to restock. From here, you go on to several distant places in the spine of the world, including haunted catacombs, abandoned towers, dark and dank dungeons, spread out over the Spine of the World and also some action takes place on the surface on a giant glacier. All these environments are perfectly made, and even today they are amazingly beautiful and detailed, and perfectly blends in with the story. For example, the glacier on Upper Dorns Deep is achingly beautiful, and I used to study it a lot just because I simply loved it so much. The rest of the graphics fit in very well, although they may feel a bit old-fashioned, but this is no problem since the feeling is just 100% in the right place. As for the sound, it is more detailed than the BG games, and now the weapons clang together (which is the detail I like most), and the sound of the environments fits perfectly, with small details such as the sound upon the open tundra, where the wind howls, and the characters boots makes that awesome sound as if walking in snow (creaking). But as for all the good of this game, the story is very thin, and you don't get very much of a clue as to why you are running around doing this (except doing it for the "greater good", if you are good characters that is), but what annoyed me was that almost the whole plot was revealed in one place, near the end of the game. Sadly, it was not too unoriginal either. Apart from the lacking story, I also found the absence of people talking to me quite disturbing, as to in BG1, where even the simplest commoner made a comment when you approached him, but here the only people who have voices are the "key persons", and this made the environments sometimes feel a little empty. One who makes an excellent job, however is the person who wrote the cutscenes to be used, and the person who was the "story-teller". The ending cut-scene is probably one of the most geniously made ever, and it almost sent shivers down my spine when I saw it for the first time. Overall, it is a very good game, though, and I am quoting a comment I heard once; "Baldur's Gate's angry little brother" as I read someone call it. The great difficulty in the game is mostly in the beginning of it, though and does not stop one from really enjoying the later stages of it. I would hardly recommend this to any newbies of D&D Roleplaying Games, but for Baldur's Gate fanatics who just wants a lot of fighting, this fits just like a glove.